WHAT does the future of the architecture industry hold? For renowned Kapampangan architect Normandy Canlas, buildings of the future will go beyond being just aesthetically pleasing. These days, he said, infrastructures should adapt to the changing environment. Thus, buildings must be engineered to be resilient and designs must do more than catch the eye but also protect us from the elements. “Climate is one of the major factors on how architecture evolves. It adjusts according to every change of atmosphere, change of weather, and natural calamities like global warming, typhoons, and earthquakes,” he noted. 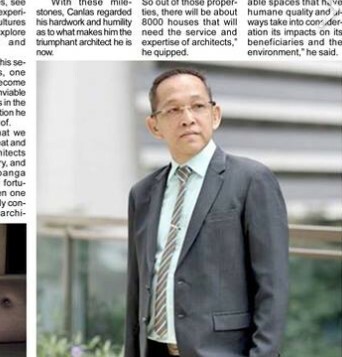 A veteran in the industry and internationally acclaimed, Canlas furthered that these 21st century phenomenon urges architects like him to strive harder in order to adapt to the latest trends, especially in technology. “Being an architect in this day and age means you have to know new trends that are innovative and advanced. More than that, you have to be guided by a new kind of thinking, one that employs design in revolutionary ways and elevates the role of buildings far beyond their primary purpose as shelter,” he explained. He noted that it’s about time that architecture makes itself useful, saving and improving lives, alleviating stress and tensions, and more importantly, addressing present challenges like pollution and waste problems. Green and eco-friendly buildings undo the damage. “Green architecture is what we need today, more than ever,” he emphasized. As his way to find more compelling ways to contribute to province and the country’s architectural industry, Canlas shared that he keeps himself updated, whether by going around or out of the country. “One factor on how architects thrive is exposure. We must go out of our comfort zones, see new places, and experience different cultures that allow us to explore new concepts and ideas,” he said. This is one of his secrets to success, one that led him to become one of the most enviable ASEAN architects in the country, a recognition he takes great pride of. “We know that we have so many great and competitive architects here in the country, and even in Pampanga alone. I am very fortunate to have been one out of the 99 newly converted ASEAN architects in the country and one of the three Kapampangans out of hundreds,” he enthused. Last March, Canlas was able to join the roster of exemplary architects in the ASEAN region when he was recognized and deemed fit by the ASEAN Monitoring Committee on Architectural Services of the Philippines. During the same month, he was also awarded at the 17th Annual Gawad Amerika Awards as the Most Outstanding Professional 2018 in the Field of Architecture. His very recent feat also includes having been conferred as fellow to the prestigious Royal Institute of Architects of Singapore. With these milestones, Canlas regarded his hardwork and humility as to what makes him the triumphant architect he is now. “For me, the key to succeeding in our field is being ‘matyaga,’ and of course, after everything is said and done, keep your humility. We have a glamorous profession and some architects tend to get swayed by the grandeur. 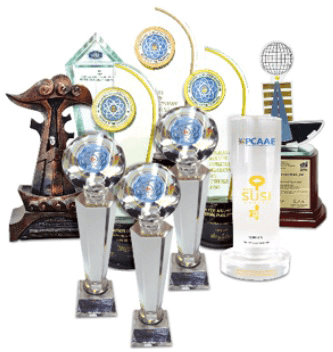 So if I have only one advice, that would be to keep your feet on the ground, especially those who are starting out to carve their name in the industry,” he noted. Asked if he recommends the said career to the younger generation, he comes with a quick reply: “Yes of course, just consider Pampanga. According to statistics, there are about 38 or 40 new subdivisions in the vicinity. So out of those properties, there will be about 8000 houses that will need the service and expertise of architects,” he quipped. “In the province, we have around 800 licensed architects, so tig-10 na kami doon. Meaning to say, there are still so many opportunities and high demand for emerging and up and coming architects,” he added. He concluded that his firm, Normandy Architecture, for its part, will continue to uphold its philosophy that represents Kapampangans and elevates the stature of Filipino architecture. “We will continue to design buildings that are not only awe-inspiring but also functional, economical, and sustainable. Indeed, our main goal is to pave the way for well-designed and livable spaces that have humane quality and always take into consideration its impacts on its beneficiaries and the environment,” he said.